Our most popular Slushie flavours, each makes 12 litres or approx 60 x 200ml drinks, HOWEVER you can also choose from our Cocktail Menu if you or the Party girl/boy perfers, they all come non-alcoholic and taste extremely yummy. "They are sure to be the talking point at school or with friends after their PARTY with our Slushies". Kids will go crazy with this favourite. Kids will also compare who has the bluest tongue. A classic favourite with all the kids. Wicked array of fruity tastes. Purple in Colour. 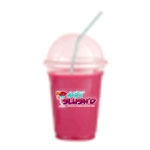 With over 1kilo of real strawberry juices, kids will go nuts over this favourite. This one tastes like FANTA. Kids will go through this before you know it, and ask for more. Combination of Oranges, Passion fruit and Pineapple to give a real tingly fruit taste. Keep the kids on their toes with this Lime flavoured tingler.